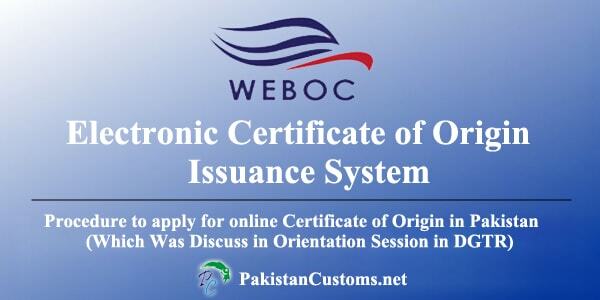 We have already informed our reader about the newly developed module for issuance of Certificate of Origin through WeBOC system, I hope many of you also attended this orientation session, which was arranged by DGTR, but unfortunately some people could not attain this session, therefore we received so many emails asking about the procedure of online certificate of origin in weboc, and when this system of online certificate of origin implements in weboc. So here we try to provide some information which we get from this session. Note: Electronic Certificate of Origin Still Not Implement in Weboc. What We Got From Orientation Session, Which Was Arrange By DGTR (Director General Training & Research) about the Issuance of Certificate of Origin through WeBOC System? On 11 May, 2016 we attained this session and when the session started, they first show us how can we apply online COO (Certificate of Origin) in weboc system, according to presenter all released Gds shows in this system, its mean that you just apply for COO when your GD`s status show “Loading Allowed” in WeBoc. They further added that when we select any good declaration, so the system will automatically fill few fields such as consignee name, description of goods etc, the system will also show all certificates according to your selected destination country in Gd, you need to select your required certificate. Note: these two documents only required for air ports Gds. After submitting, the request automatically sends to TDAP official, They have a right to accept or reject your application, in case your request accept so you will have to print this certificate on prescribe form (which will be provided by TDAP), After printing we will take the certificate to a TDAP office for signing purpose. After the presentation, question and answers session start, and people start questioning to TDAP Officials and Pral Officials. 1) If the whole process is paperless so why we print the certificate and take it to a TDAP official of Just for signing, it should be like Form-E completely paperless? A) Signing is therefore required because we have trade agreements with different countries until these trade agreements not change or finish we have to follow rules. 2) The system will take Good Description from GD which is quite short, but our buyer requirement is to put the complete description on the certificate which mentions L/C, what will we do in this case? A) We will provide you another Textarea where you will put your extra description, that you want us to print on your certificate. (I was just a suggestion). They note all valid objections and wind up this session with the promise to discuss further in the next session.